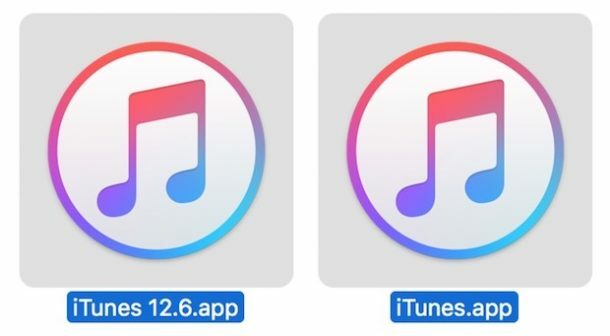 Some users may determine that iTunes 12.7 along with the removal of the App Store and other changes are incompatible with their particular workflow. With a little effort, you can downgrade iTunes 12.7 back to iTunes 12.6 on either a Mac OS computer or Windows PC. Most people should not downgrade iTunes nor attempt to downgrade, this is really only appropriate for advanced users who must use an earlier version for some particular reason. Before downgrading iTunes 12.7 you should know that you can manage and download apps on iPhone or iPad without iTunes, directly in iOS as detailed here, including manually copying apps to the iPhone or iPad via IPA files. You should backup your computer before beginning this process. Failure to backup could result in permanent data loss or data removal. Do not skip backing up your computer before beginning. This process is basically three parts: deleting iTunes, restoring the old iTunes Library file, and then downloading the older version of iTunes and installing it. Back up your Mac before beginning the iTunes downgrade process. Do not skip backing up your Mac or else you may lose data, apps, music, media, or general functionality. That’s it, you’re now back to the prior version of iTunes. To avoid downloading iTunes 12.7 again you may want to hide it from the Mac App Store or turn off automatic updates. Downgrading iTunes 12.7 can be done in Windows as well by uninstalling iTunes and then reinstalling the old version. You’ll still want to restore the old iTunes Library .itl file however. It’s important to not skip the ‘iTunes Library.itl’ file process because if you do not restore the previous iTunes Library file you will get an error message stating “iTunes Library.itl cannot be read because it was created by a newer version of iTunes”. Typically you can override those error messages by rebuilding an iTunes library, but if you can avoid that you may as well. …Because many older and excellent music production 32 bit apps can only be loaded from ipa files. Those apps have been permanently deleted from the app store due to Apple’s infinite wisdom. Why downgrade??? For the visually impaired, to sort and rearrange and group or ungroup apps using iTunes 12.6.2 was nearly perfect. Now, it’s wiggly little icons that can be hard to see. Thank you, but, that’s one reason why. For one thing, we don’t all have mobile data to burn or constant access to wifi. You obviously do. For another, I have a library of apps that’s about 3 times larger than what I have on my phone. With the downgrade I can still keep an eye on all of these easily, on a LARGE screen. I can update ones that I’m not using right now. I can keep old versions of apps in case there’s something problematic with a new version. You apparently live in a world with infinite data, a phone that can hold everything that you want, and have never ever had an app become non-functional or just downright poorly designed with an upgrade. Followed the instructions exactly and was told and I have a few hundred lines of Operation not permitted. Deleting iTunes works but make sure you are in the right place and authenticate. “operation not permitted” can’t be bypass for me too. even I try to change iTunes’s public permissions to “read & write” for everyone, it says I don’t have permission. It’s not deleteable. Wish someone find another backdoor for this issue. ps. I was using High Sierra Beta and I’m using High Sierra now. It didn’t work for both os. 1. Reboot the Mac with holding Command+R to open Recovery Mode. 2. Choose Utilities / Terminal. 4. Do exactly steps what it wrote in this page. To Re-Enable SIP, do first 2 steps. Now you’re ready to face “An unknown error occured (-45096)” just after you open iTunes 12.6.2. I couldn’t find anyway to bypass this unknown error (-45096). I just wanted to manage my applications manually. After a quick research I found some iTunes alternatives. Some of them is not working but “Syncios” is worked for me. It’s a free app and you can add manually your ipa format apps from “Music/iTunes/iTunes Media/Mobile Applications” folder. Hope someone can benefit from this too. By disabling the SIP method works. However, you need to do a few steps to install back your iTunes 12.6.2. 9. Please disable those automatic install apps update option in your AppStore. P/S: using the sudo rm -rf iTunes.app/ and installing the iTunes 12.6.2 will still get an error -45096. I got my iTunes 12.6.2 back. Good riddance to 12.7. You don’t say what to do with it. Looks like you missed a step or two. 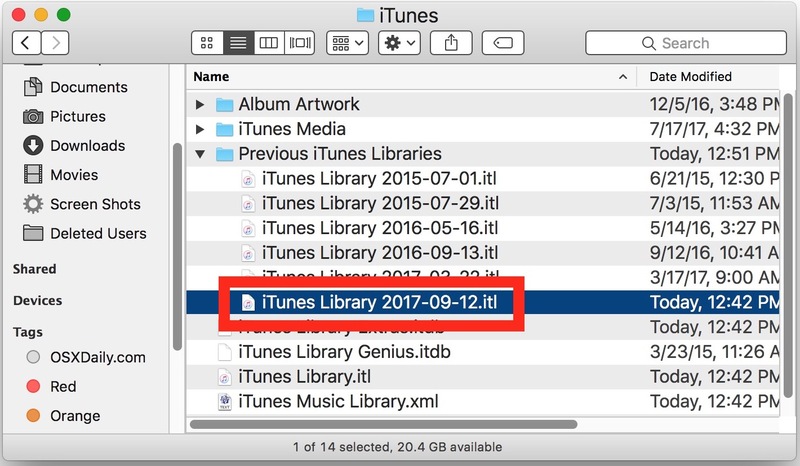 Copy the newest version of the *.itl file from Music\iTunes\Previous iTunes Libraries to another location, such as your desktop or to a temp folder. Now copy the iTunes Library.itl to the folder Music\iTunes and then start iTunes. You should no longer receive the message “iTunes Library.itl cannot be read because it was created by a newer version of iTunes”. I could not locate any Music\iTunes\Previous iTunes Libraries folder on my computer. Anywhere. Use windows explorer to search your computer for *.itl files. You have read my mind. When i openened itunes after the update a deep sigh and i remembered how i felt in my microsoft days, loooong way back. It may also usefull to stop the ituneshelper in startup items before performing this operation. ps: for people who have a time machine working (backup) . This discussion on apple might be very usefull. Steven: once you are back in the previous version and it looks good, you can delete the old itl-file. Just wondering: wouldn’t it be the same to just trash iTunes.app instead of doing it via Terminal? Try dragging iTunes.app into the Trash and you will see that Mac OS now restricts that from occurring, suggesting it is a critical component of Mac OS System software. This is why you must use the Terminal or something like AppCleaner to delete iTunes. Nice one, but remember that iTunes 12.7 is required in order to sync with iPhone 8/8s/X. Thanks for the warning I won’t upgrade then until they have a decent solution to sync photos, books and apps. Well… Some people with JB iOS devices and a large collection of craked apps can visualize and manage these apps (.ipa files) with iTunes. Icons to locate faster these apps, informations like versions… I think that it’s easier than using finder’s folders. I am a nonuser of ITUNES. I could barely navigate it under the old version. I am completely baffled by this new version. Why would Apple change an App like ITUNES to something that is less user-friendly? Approximately two years ago I was running a back level 10.4.11; the thing worked, no bugs and I never had to reboot the thing. One time I left it running for two months while I was not at home. 10.4.11 worked all that time no human intervention, all it did was get an email. Now I am at 10.12.6, and I have found so many bugs in Apple software that it makes my head spin. I called in one nasty bug and Apple appeared to have lost the problem. I opened the same problem and went through problem determination again over the phone and this time I seemed to have gotten through as Apple said there were other people complaining about the same issue. I am awaiting a fix. Why is Apple sending out so many bugs now? Thx, it helped a lot and went smoothly – haven’t ever done such an operation that fast. I was exited about IOS 11, this kind of ruined that. Among so many advantages of tethering, the ability to revert to an old version of an app that worked. I’ve got 2 apps that I currently don’t update because they latest version breaks things important to me. I know of no way to go back directly on the device. Tired of Apple taking away functionality because they know “what’s best for us”. More and more like the old Microsoft while MS gets more like Apple used to be. Miss Jobs. I would bet the farm that High Sierra will NOT be compatible with any version of iTunes except this new downgraded one. I have reached the end of the road with OSX. I will NOT update to iOS11, and I will NOT update to High Sierra, as both are major downgraded IMO that do not at all work in my workflow. I have talked to many other OSX/iOS users who feel the same way, and are looking to other options for a permanent solution. It’s as if Apple is trying to fail it’s loyal users. Wow! iTunes must have decimated your life. Or maybe it was Apple. That said you are very smart to head on over to Microsoft. And I’m confident that in 20 years we will see you back over on the Apple side. It’s only just a computer. And hardly worth living in black and white. Way back when El Capitan was offered I read a review that said, “I don’t want my computer behaving like a phone.” Yeah, I thought, and neither do I. I’m still on Mavericks — the most rock solid OS ever and the last Apple OS that actually allows the user to decide what to upgrade and where to get the app. You wouldn’t believe the trouble I had trying to get Mavericks again when my hard drive fritzed. Just try finding the complete system online. But, I was successful and now have the entire thing on my backup. anyone know is iTunes 12.6 is compatible with High Sierra (beta)? Tried this on Windows 10. Downgrade comes back with “iTunes cannot run because some of its required files are missing. Please reinstall iTunes.” Have tried uninstall of all apple programs. If there is a solution, I’ll downgrade 12.6 when it is figured out or move to some “free” centralised update service on my PC. Now I’ve got office apps not updating. The unnecessary constricting policies by apple. You stated that “In Windows, navigate to where your iTunes Media folder is and open “Previous iTunes Libraries” and make a copy of the most recently dated iTunes Library.itl file in that directory” but what do you do with that file, where do you put it and/or do you have to change its name. What do you do with the copied file? Thanks in advance for your reply. @ Ronald, the new itl file will go into the itunes folder and will replace the file created by the 12.7. I was using the itunes to install apps across multiple devices. Is there a way to extract the IPA file from the phone/ipad. A backward step as far a Iam concerned. It wasn’t explained clearly for the Windows install but basically you want to replace the file called iTunes Library.itl in your C:\Users\\Music\iTunes directory with your saved version from the Previous iTunes Libraries directory (renaming it in the process). 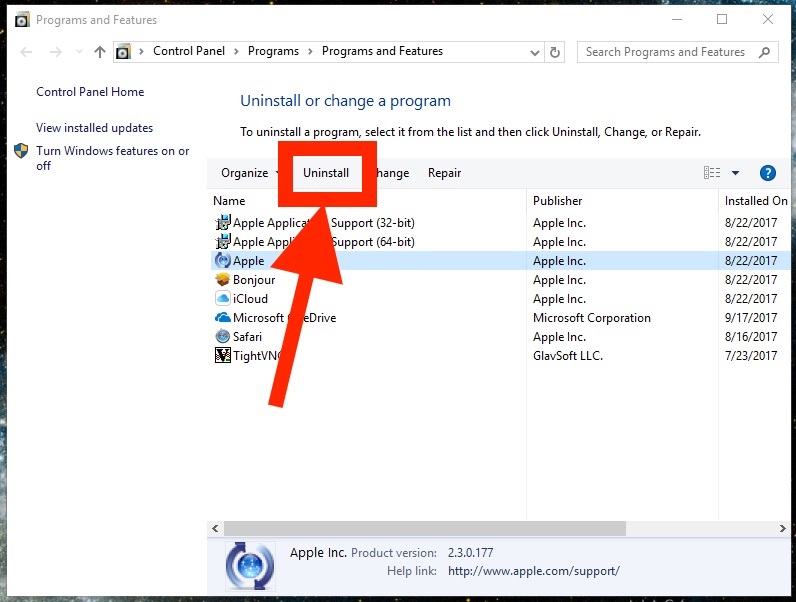 Do this before you launch the application after the reinstall. Frank, could you please help me with some further clarification. I’m still not sure where to put the saved (previous version) file. Within my iTunes Folder I have three sub-folders (Album Artwork; iTunes Media; Previous iTunes Libraries) plus four files (iTunes Library Extras; iTunes Library Genius; iTunes Library; iTunes Music Library) plus a load of temporary files. Can you please tell me which folder should be the home for the saved file. Thanks in advance. I just stupidly updated to 12.7 for Windows and the first thing I saw was that message about removing the ability to manage my apps. Not only was I thinking about all those old apps that no longer exist on my iPhone but how I regularly use iTunes to mass copy my video files across to apps like infuse or VLC. Is there a way to do that still or have I lost that ability with this ‘upgrade’? I don’t have that interface up anymore because I downgraded so I can’t tell you exactly how to do it, but I do remember that that was one thing they didn’t take away with the upgrade. You can still copy directly to an application like you used to. It wasn’t hard to find either. SWEET!!!! Easy and straightforward. Thank you soooo much for this article and instructions! Got my MacBook Pro back to where it works the way I want it to, not Apple. It’s frustrating when we follow the instructions (seems not complete, though?) and it didn’t work. Spent half a day trying with no result. Thanks Apple for making things more difficult for your users instead of making it easier. Thanks so much – worked a treat and was all done within 5-10 mins (when I’d been ‘looking forward’ to reinstalling El Cap just to get iTunes back to the more helpful version). What and idiocy by Apple – I use it mostly to manage my large image collection with the Photos app synced to iPhone and books, and yes apps too. Live in a country with low bandwidth – much better to download to stuff via fibre to computer. Plus I manage all photos and books on y computer – cloud is a) too slow and b) why would I trust my data to the cloud – too much abuse nott enough privacy c) bandwidth is very expensive and not cost effective. I feel with the comments about Apple having lost its way – they seem to get worse with every release and constantly are loosing functions. Here’s another good reason to upgrade back to the previous version… support for the Apple TVs that have internal hard drives. I can’t find any reference to it, but Apple removed support for the old hardware. It was bad enough that I now have to download my apps six times for six phones/pads, this clinches it, time to go back. Many thanks. Luckily I have a “spare” on my desk – A miniMac which I do keep updated (well, I’m stopping OS updates – It’s on El Capitan) but only use for a few things. I went into shock when I went in to manage where apps were on my iPhone screen which I normally do using iTunes. I did the terminal to remove and reinstalled iTunes 12.6.2 on the miniMac. Everything works now. I preferred having my iPhone always connected to my main iMac, but so be it. I’ll probably leave my iPhone 6s+ at iOS 10, too. And I’ll keep my late 2012 iMac on El Capitan. I’ll wait a couple years and see what happens. By then I may be ready for a new iMac (Or something else the way things are going…). But as it is, everything works including Mucho $$$ in software so I’ll “freeze” and no longer do updates. A Mac person since 1986 and this is beyond disappointing. What Apple really needs is an application for MacOS with which a person can totally manage their iPhone, make calls, whatever (even run installed apps) in the MacOS application. My Thanks for the article. It made my morning. Thanks so much for the instructions, I was able to downgrade iTunes 12.7 back to 12.6.2. I was silly enough to update without looking at the new changes and was so upset when they got rid of the ringtone management tab. I completely loved my custom ringtones but lost them when I upgraded my iphone 6 plus to ios 11 and then downgraded back to ios 10. Don’t know what the fuss is with apple these days… If it ain’t broke, don’t fix it!!! My iPhone 6 plus will remain on ios 10 as well, it had serious lagging issues on ios 11. Worked without a problem but, within a few days, 12.7 was back. I haveIn iTunes Preferences unselected the automatic check for updates in iTunes Preferences and have not run Updates in the App Store. No idea how it is happening but I am stuck with the worthless 12.7 once again. Has anyone else had this problem or do you have a selection? I used the App features in 12.6 and the App store is a VERY poor substitute. The phone is used for work and I haven’t listened to music or movies on it for years, in my opinion, there are better ways. As it is, 12.7 is a waste of memory and I would delete if possible, but the ALL KNOWING in Apple don’t allow that! Dating myself, my first Mac was a 512 but I am strongly considering changing that on my next purchase. Thank you, you have saved me from a great shock that ruined my morning. I am, despite the rescue, still massively angry at the stupidity of this move. Apple apparently believes that everyone can just download apps that might be as large as gigabyte, and will never want to keep older versions of apps. It’s hard to avoid the feeling that the aim is to prevent individuals from owning or possessing anything. Next they’ll take away the ability to save and keep podcast episodes on my computer (an ability I was specifically praising only a few days ago), then they’ll decide that streaming Apple Music is the only music option. This worked perfectly for me. Best description of how to downgrade that I have ever seen. Thank you for the simple clarity. I followed the instructions and when opening the downgrade, it says a newer version is already installed and quits. I have tried the Terminal instructions twice just in case and still get the same response. Any idea what I can do? Thank you!! This worked flawlessly for me. Thank you so much! This just saved our school district’s after school iPad program. There was no way I could hand download and manage 5-20 apps on 80 iPads every five weeks. I use Apple Configurator 2 to change apps every month on 10 iPads at a time but without a functional iTunes app element I would never be able to keep apps updated, remove, or add new ones every month like I do. Truly saved the quality of our programming! Why on earth does Apple think people only want wifi/data based single app management ability? Not everyone has access or one device. I cannot understand the reasoning behind removing the app store from iTunes entirely. Hey Marisa, glad to hear this helped. Another option is to download iTunes 12.6.3 which is an alternate release that includes the App Store support. I also do not understand the reasoning behind removing the App Store from iTunes while so many people rely on it. First, THANK YOU. This worked great! First, TURN OFF auto updates. I went through all this – synced my files, etc … woke up the next morning and iTunes 12.7 was re-installed. Second, Time Machne will NOT downgrade iTunes. I had backed up and when I tried it said it was part of the OS and couldn’t be changed – not even an option for a password override. Thank goodness your directions are relatively simple. This is by far the best instructions set found on the whole internet. I’ve spent countless hours over the phone with Apple Level 2 support (a very decicated support guy embarassed by the absence of warning from Apple) trying to fix my old 2009 Mac mini, my 1st Gen (Silver) Apple TV (where I keep all my picture, music and videos for the last 5 years) and, my 3TB WD MyCloud (TimeMachine Backup) that all ceased to work fine after updating to El Capitan and iTunes 12.7. By going back to iTunes 12.6.3 I’ve regained access to my Apple TV but my WD MyCloud is no longer supported under El Capitan… 3 years of daily back-up gone without notice! What a mess… No Warning from Apple. Thanks to the OSXDaily community! Followed the MacOS instructions. Terminal refuses to delete. Now what? I finally tired of not being able to manage apps (even after trying Configurator). But since I ran 12.7 or a few months, naturally all of my play counts are goofed up. Do I just live with it as lesson learned? Or can I get them back? Followed the instructions for Mac, but after downloading iTunes 12.6 and clicking, the installer just hangs there with a window that says “Varifying Install Itunes” and it’s done nothing for an hour, not even the verify bar has moved. WHere do I go from here? This syntax works great, but you must disable the System Integrity Protection (SIP) prior to making this work with Mac OS High Sierra. On reboot, hold CMD + R, go to Utilities, open Terminal, and type csrutil then reboot your machine. Apple has a very simple process to do this. You don’t need Terminal or any of that other hocus-pocus. And you’re done (I looked for this for two hours, and did it in two minutes. Thanks Bill this worked a treat. What a Godsend. I work in a school and this update is a disaster for App Management. Working from a Mac for central deployment using Apple Configurator 2 you can no longer browse for iPad only apps using iTunes or the App Store. Going back to iTunes 12.6 brings it all back. Hallelujah. I did this and it worked, but I lost all my playlists on the reinstall. How do I restore? It would have been of great help if this information was included in the How-to-steps above. I have recently been through this. The problem is with the latest iTunes. I followed the instructions as to how to revert to iTunes 12.6.3. Then I backed up my iPhone 6 as normal. Once done, I then connected iPhone x and tried restore from backup. I received the message that iTunes 12.6.3 was not compatible with the new iPhone so I merely re-downloaded the latest version 12.8 and tried restore again. Worked perfectly without fiddling with any terminals or complex stuff Nobody at Apple was able to explain this but it is that simple. The newest version of iTunes 12.6 (12.6.5.3) installs right over a newer iTunes, including 12.8. No deletion needed. All you need to do is swap the iTunes Library.itl files. How to swap both the latest version and the 12.6 version? I don’t know how to install the same app but they are the different version in the Mac. Would you like to say more? It looks like this is no longer possible. I’ve tried a few ways to uninstall iTunes including removing protection of Apple apps, but now with Mac OS Mojave, iTunes is integrated with OSX and nothing will remove it (even if you move it to trash and delete all associated files) and you can’t restore it. I’ve told Apple I have for a long time used Google and Amazon for entertainment products, I won’t even consider the Apple Music free trial now.